Celebrating Chinese New Year Here in Shanghai? Apart from the fireworks, Chinese New Year is the quietest time of year here in Shanghai, which is why it makes it such a great time to explore the city and enjoy the sites of Shanghai in the Year of the Monkey. Why not try out one of the new bike and ride schemes here in the greater Hongqiao area and explore the city. § The deposit for the card is 200 RMB, card issuing fee is 15 RMB , and annual fee is 10 RMB. § 100 RMB will also be requested as a first one off fee. Total amount of money you will need to take is 325 RMB. § Once you have the bike card, this can be swiped at any of the stations. § To return the bike at any of the stations listed, swipe the card again. A voice prompt will be given when swiping the card. § Remember to always wear a helmet when cycling. The Hub, the exciting new mall located next to Hongqiao transport terminal has new experiences opening all the time. There is an Imax 3D cinema as well as lots of great eating places. Why not try the new Imperial Treasure restaurant now open at The Hub. It is reputed to have the best dim sum in town. You could hop on at East Xujing on the metro at the end of Line 2 and be there in just two stops. If you enjoy a relaxing stroll or cycle, the former French Concession will never disappoint those interested in the history of Shanghai, its architecture and of course its plethora of restaurants. 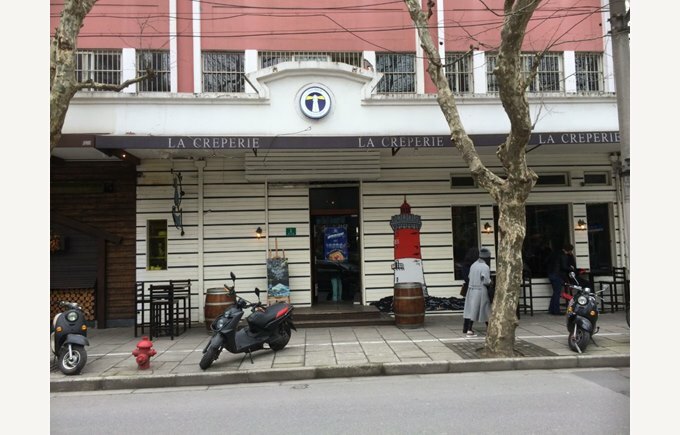 What better way to spend an afternoon than strolling around its tree lined streets and ending up at La Creperie situated on Taojiang Lu, near FenYang Lu to enjoy mulled cider and crepes smothered in caramelised apple or chocolate sauce. Family friendly, this is a great brunch venue. Heading across the Huang Pu River to the south bank you could chill out at the The All-star Ice Skating club now open at the Mercedes Benz arena. Still on the Pudong side of the river, the Science and Technology museum makes for a great day out. From the Greater Hongqiao area, it is easy to get there on Line 2 of the Metro, getting off at Century Park. Here you can also practice your haggling techniques at the fake market located within the station complex. No one can resist chocolate and at Zotter’s chocolate factory they have 365 flavours, one for every day of the year. Located at the Shanghai Fashion Centre on Yang Shu Pu Lu, this is guaranteed to be both educational and a treat. There are monkeys to discover that live underwater at the Shanghai Ocean Aquarium. The highlight for this month is the Monkeyface Eel. Dianshan Lake is the source of the Huangpu River and the largest natural fresh water lake in the city. It covers an area of 24 square miles and has a shipping lane that runs through the middle. There are lots of interesting places to visit around its shoreline including the water town of Zhujiajiao. Why not make a day of it and head out of the city to explore the west. Yu Yuan is a sight not to be missed during the Spring festival. Running from 8 - 25 February 2016, you can experience Chinese traditions of lanterns, dragon and lion dances, as well as joining in game of guessing lantern riddles. The amazing fireworks display that takes place at the Bund is special to see but perhaps from a distance. Places on the Bund such as Mint, Vue, Bar Rouge, Mixx, and popular clubs such as The Apartment, Craft, Geisha, The Mansion are among the main party spots if you are heading that way to celebrate.